It was about 2pm when we first arrived at Turnberry. I was exhausted, having been traveling for close to 24 hours and not sleeping a wink on either of my plane rides. However none of that mattered as we pulled up to the Links Lodge Bed and Breakfast, which was literally right off the first green of the Ailsa Course at Turnberry. Note: I can’t recommend this place highly enough. The owner Chris was fantastic, and the location is incredible. It became immediately clear that this was one of the most beautiful courses and regions in the world. Rather than play on our first day, we decided to wait and give us time to relax, rest, and take in a little bit of the small town of Turnberry – this proved to be an excellent decision. After a quick rejuvenating nap I spent 45 minutes walking down the beach at sunset, taking photos of the course and just taking in where I was. This marked my first trip back to Europe since I was in college, and I don’t think I’ve ever felt like I was so far away. I travel to Asia on a fairly frequent basis these days, so it almost feels normal. This, however, even with people speaking English truly made me feel like I was on the edge of the earth. Everything was peaceful, all I heard was water. The occasional golfer strolled by on the 3rd or 4th greens, but what this time allowed me to do was really soak in and appreciate my surroundings – something I’d encourage everyone who visits Turnberry to do. We had dinner at Souters Inn, which was about a 7 minute drive from the resort, and it was one of the best travel experiences I’ve had. We met almost everyone at the restaurant. They wanted to talk golf, travel, whiskey, the US, the impending referendum. I expected lots of tourists, but all we found was extremely friendly Scots who insisted on buying us tastes of some of the local scotch (that you won’t find anywhere else in the world). To say that the trip was off to a good start would be an understatement, and we hadn’t even gotten to the first round of golf yet! We arrived at the course the next morning and couldn’t wait to get going. We checked in and headed to the range to get warmed up. After hearing that most courses in Scotland didn’t have a range, I was kind of surprised to see it along with a the full Turnberry Performance Academy there. Definitely some of the better practice facilities we saw on the trip. I also got my first crack at practicing out of a pot bunker, and let’s just say it was a little rough. We couldn’t have asked for a more perfect day to start the trip, as the weather was just as beautiful as it was the previous day before. One of the things we noticed pretty immediately was how unpretentious everything was. I mean this was one of the most historic courses in Open Golf! It’s where Tom Watson hit a 7 iron 178 yards to two feet in 1977. It’s where he also almost became the oldest person to every win a major in 2009. The 18th green was just right there, all that history. It wasn’t behind a giant gate, or closed off with a bunch of security guards. It was a mere 50 feet from the road and locals were walking their dogs right by the course. This would be the first taste of how Scottish golf differed from golf back in the States, and I’ve gotta say – in that regard, I really liked it. Fees: £85-250 depending on guest status and time of ear. We headed to the first tee, and the starter proceeded to give us one of the best starting “packages” I’d ever received. With our scorecard, we got a yardage book, and a Turnberry tin with tees inside. A nice touch that makes you feel as though the £250 greens fees for non-resort guests are really worth it. The starter offered to take our photo – and you can tell it wasn’t the first time he’s done this. Unlike most people who never seem to be able to get on-course photos framed up or in focus, he had us stand right behind the Ailsa Course sign, and snapped a great shot to start the trip. Note: We played from the Trophy tees which measured 6100 yards – all distances from there. As it was our first round we decided to take it a bit easier on ourselves 🙂 Also click on any photo for a full slideshow of the round. Named after an island in the Firth of Clyde – I liked the way this course started. Nothing too difficult, but if aren’t careful you could find yourself in trouble – as I unfortunately did. I hit a solid hybrid, but my first shot in Scotland landed in, where else? A pot bunker. Luckily I chipped out sideways and still made bogey – so I was feeling ok about that. Watch out for the bunkers all down the leftside of the fairway, and surrounding the front of the green. Bailout is long and right here. The second hole at Turnberry can be a brutal one if you’re not careful. This was my first introduction to bunkers in the middle of the fairway since last time I played Pacific Dunes – and fortunately (or unfortunately) for me I duck hooked it into the third fairway (still chipped up for par). The green runs off to the left so make sure you take enough club. In theory, I wasn’t a huge fan of the lapping the 2nd and 3rd holes seemed to do, but I really liked the third hole – especially considering it was bringing you ever closer to the water. A slight dogleg left, if you’re too far right here you’ll have tough shot out of the rough – just watch out for fairway bunkers on the left. It’s one of the longest par 4s on the course, and our caddie mentioned we were extremely lucky as it usually plays directly into the wind – there was no wind to be found…yet. Contrary to the name, I think the tide is less of a concern here when compared to the giant bunker in the front right. There’s a big bunker to the bottom right of the flag. This is #15 at Bandon Dunes. Notice the similarities. If you’ve been following my blog for awhile you know that often it isn’t the long championship courses I like the best, but it’s the ones with a little more interest and uniqueness, and I really felt this hole had that. A long, sharp, dogleg left the best play is directly over the two bunkers on the left – however the safer play is center of the fairway – giving you a long approach in. The approach shot isn’t any easier with a forebunker on the left, followed immediately by two greenside bunkers. I was playing in wiht a 6 iron and Dan had a 4 wood – so depending on where you’re at, this can be really tricky. The dunes on either side of the fairway also added a cool feel to the hole. When you walk up to the 6th tee box a bit of excitement builds as you can see the famous lighthouse looming in the distance. This is one of the tougher par 3s on the course. The green slopes severely from back to front – and if you don’t get it squarely on the center of the green there’s a good chance it’s coming back. I hit a solid hybrid to the front of the green that looked like it would stay. 10 seconds later, it slowly started falling back down, before finally resting 40 yards short (and below) the green. This is also the first hole where we realized how valuable a caddie can be. Dan had a 35 foot snaker for par, and he put it right on the line that his caddie told him. Right in the back of the cup. The par 5, 7th isn’t quite a “Cape” hole but pretty close. The hole bends sharply to the left and there’s deep rough if you don’t hit the fairway. You can cut off some of the fairway if you’re feeling ballsy and go for it in two, just watch out for the bunker directly over your target line. That being said, your second and third shots are pretty severely uphill, so your best bet is probably to play it conservatively and hit 3 good shots into the green. Another slight dogleg left – I didn’t realize how many of them there were on this course until I started going back and writing this. The nice thing about links golf is that the holes are pretty open – so it’s not like the Pacific Northwest where a dogleg left is often narrow and treelined. Even my typical slice, could often keep me in the fairway. The toughest part of this hole is the bunkering. Fairway bunkers on the right, and a deep bunker short and left of the elevated green. Now don’t get me wrong, this was a beautiful golf hole. But it wasn’t quite as spectacular as I was expecting. I was thinking it would be more right on the water – and the hole itself I found to be relatively uninteresting. Straight out with a semi-blind tee shot over a ridge – I really felt like they could have done more with the land. I do regret not heading back and hitting one from the Championship tees here, as I definitely think they made the hole quite a bit more interesting, forcing you to hit over the craggy rocks. But honestly, guests can’t play from those tees (nor should most of them), so while yes it’s an Open Rota course, I would have liked to see them make it more dramatic for the 98% of rounds on the course. It’s also worth noting there is a lot of history surrounding the area around the lighthouse – and you can see some of the remnants in the form of old stone walls. I’d loved to have a plaque or something that told more about the history of the area (if there was one, I somehow missed it). Me on the 9th tee. Ok, this is where the wow factor showed up. Everyone had told me about the 9th hole, but for some reason completely unbeknownst to me – no one mentioned the 10th, which is the coolest and most scenic hole on the course. A long dogleg left directly around the water, and playing slightly downhill, this hole immediately from the tee, immediately evoked thoughts of the 6th at Tetherow, which I’d played the week before. Funnily enough, this is another Kidd design – so I can see where he got a lot of his inspiration. You have bunkers in the center of the fairway, forcing you to make the decision to try and tackle the water and go to the left of the bunker, go to the right, which brings the rough into play, or layup short – giving you a long approach shot. The island bunker guarding your approach shot was definitely a cool feature and something I hadn’t seen before. The 6th at Tetherow in Bend, Oregon. The first par 3 on the back, is also the last of the three holes playing along the water. It’s a scenic hole, yes, but is it a world class par 3? Not necessarily. It’s pretty flat and the main defense are the two steep faced bunkers guarding the hole (primarily the left one), which had a great pin placement directly behind it. Don’t me wrong, it’s by no means a bad hole, I just feel as though there’s a lot that could have been done to make hole even more visually interesting and strategic. This hole get it’s name from the monument on the hill that commemorates the airmen who lost their lives while stationed at Turnberry during the World Wars. It’s interesting to note that the whole course and region was heavily involved in WW2. Some of the fairways were converted to landing strips, and the hotel was used as a hospital to treat the wounded. Another hole that usually plays into the wind, you need to navigate your drive carefully, being mindful of fairway bunkers jutting out on the left. I got lucky with my approach barely clearing the scary bunker guarding the front right of the green, and having the ball roll back down to the center of the green. A dogleg right, watch out for the three fairway bunkers off your drive. The green here is larger than it looks from the fairway, but make sure you hit it, as if you miss, you’ll have a tricky pitch back up to it. A long, and difficult par 4 that wasn’t necessarily my favorite. The hole plays uphill, and you need to watch out for the bunkers on the right off the tee. The green is surrounded by three bunkers on the front and both sides, and there’s a good chance you’ll be playing with a mid to long iron in. The last par 3 on the course is also one of the longest. On a clear day you’ll have a beautiful view of the hotel in the background, and trouble awaiting you on both sides of the green. If you’re too far right, you’ll fall down a sleep slope in the rough, and if you’re left you’ll have a deep pot bunker to contend with – this gets even scarier with a left hand pin placement. This long dogleg right was redesigned for the 2009 open – and features one of my favorite approach shots on the course. The burn is a feature of Scottish golf that I was looking forward to seeing, and this would be my first run in with one. “Wilson’s Burn” guards the front of this green, and you want to make sure you take enough club – as the rough is cut pretty short, and just about anything landing short of the green has a good chance of rolling back in the water. This was my favorite par 5 on the course and a great hole to have in the finishing stretch. Oh, and by that I also mean, the only par 5 on the course, as it plays to a par 69. It’s reachable in two, but anything other than a well placed tee shot could leave you in the rough without a shot at the green, or worse, in the large fairway bunker on the right. The bunkers that appear to be on the right of the green are actually forebunkers, giving you plenty of room to hit over them. The miss here is short and right as there’s actually quite a bit of open room there – as long as you get past the aforementioned bunkers. Ah, one of the most storied holes in Open Golf. 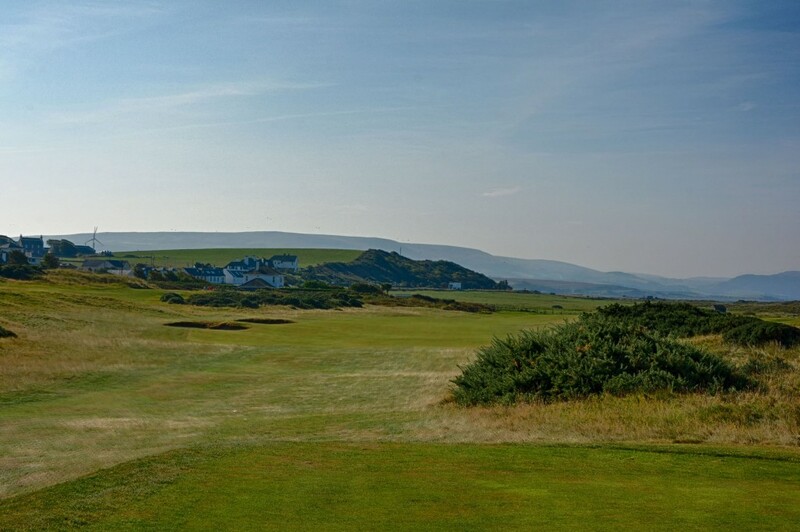 Renamed to commemorate the 1977 Open, Duel in the Sun requires a solid tee shot avoiding the three fairway bunkers on the left – and gorse on the right. There’s a good chance you’ll still have a long approach shot, so be careful and err short of the green and putt or chip on if need be. Dan and I both tried Watson’s 178 yard shot, with a 7 iron no less, and well, let’s just say we didn’t drop it to within 2 feet. Overall our day at Turnberry couldn’t have been better. The course wasn’t that packed, so we could play at our own pace, the weather was phenomenal, and both Dan and I didn’t play half bad. Of the Open Courses we played I’d say it was a toss up between here and Carnoustie for which one was my favorite. Turnberry absolutely had the scenery and vibe, but I felt that Carnoustie had holes with a bit more interest. That being said, of all of the 9 courses we played on the trip, Dan liked Turnberry the best. It’s absolutely worth the trip and the money to play on any Scotland trip, and everyone we encountered here was extremely friendly and excited to see us there. I’m looking forward to watching the Open next time it makes it back here, and also curious to see what changes occur over the next few years now that Donald Trump has purchased the course and the resort. What a lovely review and fantastic pics! Hope your meet up went well in Edinburgh, sorry I couldn’t make it.